Gwadar, March 31 (Nikkei): The idea of transforming the ancient fishing village of Gwadar into a bustling port city has been around since at least 1954, when Pakistan commissioned the U.S. Geological Survey to examine its coastline. Their conclusion: Gwadar, which sits on the Arabian Sea, would be an ideal location for a deep-water port. Gwadar’s potential went unrealized for decades, but it is now at the heart of a hugely ambitious plan known as the China-Pakistan Economic Corridor, or CPEC. China has pledged to spend $63 billion to bolster Pakistan’s power plants, ports, airports, expressways and other infrastructure under the initiative, which Beijing positions as one of the pillars of its $1 trillion global Belt and Road Initiative championed by Chinese President Xi Jinping. The gains for China in all of this development are perhaps less visible, but potentially far more significant. A major goal for China is to link its landlocked western region to the port at Gwadar. This would allow ships carrying oil and other goods from the Persian Gulf to avoid the “choke point” of the Strait of Malacca, shaving thousands of kilometers off existing routes frequently patrolled by foreign navies. For all this grand ambition, some analysts have doubts. Pakistan’s trade deficit with China has been rising, and there are concerns about what happens if it is unable to repay its debt. As with other countries that have benefited recently from Beijing’s largesse, some in Pakistan worry that the price of such investment could be a huge debt burden. The China-Pakistan corridor “will no doubt be a game changer for Pakistan, but we need to be careful,” said Ehsan Malik, the CEO of Pakistan Business Council, a business policy advocacy forum. “Ten years’ tax concessions, 90-year leases for Chinese companies and cheap imports will impact the competitiveness of existing domestic industries,” he explained. Pakistan symbolizes both the promise and the potential peril for countries participating in China’s BRI undertaking — arguably the largest investment drive ever launched by a single country — and its related projects. 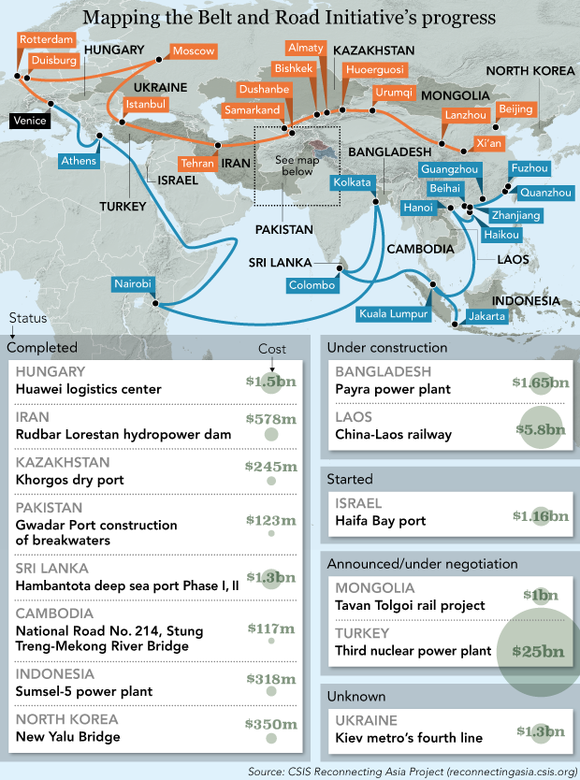 The Nikkei Asian Review and The Banker examined how BRI projects are unfolding in eight countries: Indonesia, Sri Lanka, Kazakhstan, Bangladesh, India, Poland, Laos and Pakistan. We also collaborated with the Center for Strategic and International Studies’ Reconnecting Asia Project to aggregate key BRI infrastructure projects worldwide. Project delaysAfter initial fanfare, projects sometimes experience serious delays. In Indonesia, construction on a $6 billion rail line is behind schedule and costs are escalating. Similar problems have plagued projects in Kazakhstan and Bangladesh. Ballooning deficitsBesides Pakistan, concerns about owing unmanageable debts to Beijing have been raised in Sri Lanka, the Maldives and Laos. Sovereignty concerns In Sri Lanka, China’s takeover of a troubled port has raised questions about a loss of sovereignty. And neighboring India openly rejects the BRI, saying China’s projects with neighboring Pakistan infringe on its sovereignty. Mushtaq Khan, an economist and former chief economic adviser at the State Bank of Pakistan, acknowledges that the country’s debt to China is rising. But he says Beijing “cannot afford” to bankrupt Pakistan — in part because of the country’s importance as a counterweight to India, a regional rival of China’s. Gwadar, with a population of 110,000, is 90 minutes west by propeller plane from the mercantile city of Karachi in southern Pakistan and just 70km from the border with Iran. China refers to neighboring Pakistan as its “all-weather friend,” but the country is not known for having a healthy business climate. Pakistan ranked 147th out of 190 countries and regions in the World Bank’s Ease of Doing Business 2018. The country’s economy has been battered over the years by terrorism, fuel shortages and tattered governance, but it grew 5.4% in the year through June 2017, the fastest pace in 10 years. The State Bank of Pakistan forecasts growth to approach 6% in the year ending June 2018. The projects are underway with the belief that the troubled nation can join the vibrant club of emerging Asian economies. 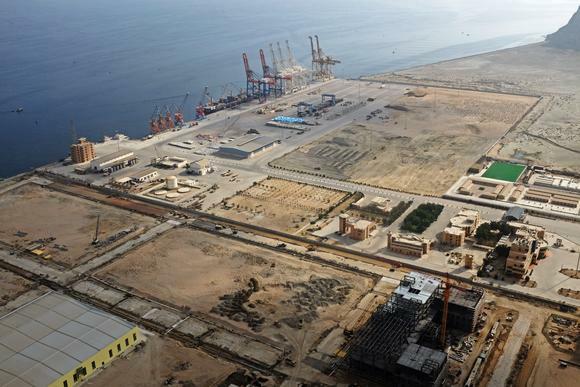 The government of Pakistan plans to transform Gwadar into one of the world’s largest port cities by 2055, housing steel mills, terminals for liquefied natural gas, oil refineries and other facilities. Under the plan, trade and industrial zones will be concentrated on the city’s east side, while the western side of the peninsula will serve as residential and tourism areas. “Gwadar port will be a hub to link Afghanistan and Central Asia, but it is not just a trade and logistics center,” said Dostain Khan Jamaldini, chairman of Gwadar Port Authority. “Gwadar port is not given to China only,” Jamaldini said, stressing the authority’s willingness to welcome U.S., European and Asian companies. Such developments have unnerved neighboring India, which has rejected the BRI program because China is financing projects on land that is claimed by both India and Pakistan. Arun Jaitley, India’s finance minister, says the BRI violates India’s sovereignty. “We are not a part of the project, and the proposed [BRI] road passes through what we regard as Indian territory,” Jaitley said, referring to a project in the Gilgit-Baltistan area of Kashmir. Both India and Pakistan claim the Kashmir region. But as the port’s losses began to mount, the government in Colombo found itself unable to repay its debts. The country had an external debt of $48.3 billion at the end of 2017, and its annual external financing needs are $11 billion — roughly the same as its annual tax revenue. Sri Lanka’s debt to China totals $8 billion and is said to carry an interest rate of 6%. “We had to take a decision to get out of this debt trap,” said Mahinda Samarasinghe, Sri Lanka’s ports and shipping minister, of the reasoning behind the 99-year lease. Government critics have said Sri Lanka’s sovereignty has been compromised by the port episode, which came only two months before the former president of neighboring Maldives warned that its debts to Beijing could force the country to cede territory to China as early as next year. Sri Lanka is located at a strategic point for the BRI. The port of Hambantota is indispensable for China’s energy security because the country imports two-thirds of its oil through shipping lanes south of the port. Jonathan Hillman, director of the Reconnecting Asia Project at the CSIS, says India has been watching China’s activity in Sri Lanka with concern. “The docking of a Chinese submarine at the port of Colombo in 2014 is one reason why the handover of a port at Hambantota in December 2017 raised alarms in Delhi. The nature of the Hambantota transaction, a debt-for-equity deal, also raised concerns,” he said. In 2009, President Rajapaksa put an end to Sri Lanka’s civil war with the Liberation Tigers of Tamil Eelam (LTTE) and shifted government policy from fighting toward improving infrastructure ahead of the presidential election in 2010. The development of Hambantota Port, located within his constituency, was a typical project. Rajapaksa kicked off the construction of Sri Lanka’s second international airport in Mattala, an inland town 20 km from the port, in 2009. Of the $209 million construction cost, Exim Bank of China put up $190 million with a concessionary loan. Mattala Rajapaksa International Airport is now called “the world’s emptiest international airport” because it has only four regular flights arriving and departing per week. The Sri Lankan government plans to sell the airport, too. China is also involved in a $1.5 billion project to build “Port City Colombo” on reclaimed land in the capital. The $1.4 billion first phase of the project is being undertaken by a subsidiary of China Communication and Construction Company. Sri Lanka’s debt equals 81.6% of its gross domestic product, which the International Monetary Fund says is the third-highest ratio among emerging economies. To the Sri Lankan government, “there is no country or institution with ready cash other than China,” a senior economic official said. In the middle of a tea plantation outside Bandung, Indonesia’s third-largest city, sits the future site of one of the four stations on the country’s first high-speed railway raraiway system.way. The railway is one of two ongoing projects under the BRI in Indonesia. Launched in January 2016, the planned 142km railway that will connect Jakarta and Bandung was supposed to illustrate China’s expanding economic power and influence. But as of late February, local officials said only 10% of the work had been completed, making it impossible for operations to start next year as scheduled. A funding crunch is also starting to raise concerns over the financial health of Indonesian companies involved. Paperwork and permit problems halted the project in its first several months, after which land acquisition proved to be a major headache. Only half of total land needed has been secured. Rising land prices during the delays is partially responsible for the project’s growing price tag — from $5.5 billion when it was announced to $6 billion. “The CDB will [start] loan disbursement this month,” Chief Maritime Minister Luhut Panjaitan, whose office oversees joint Belt and Road projects with China, said on March 9. But since the bank signed the loan agreement during the BRI forum in Beijing last May, deadlines for distributing the money have been pushed back time and again. Analysts say it is unlikely China will cancel its funding given Indonesia’s strategic importance as Southeast Asia’s largest economy. But some think China has other, more pressing, priorities. “[High-speed railway] in Java island is an investment that could wait, as China has more immediate incentives to strengthen its trade routes in its neighboring countries that are not separated by seas,” brokerage Reliance Sekuritas Indonesia said in a note. The second active BRI project in Indonesia is the Morowali Industrial Park on Sulawesi island. The island already hosts Chinese nickel smelters and a stainless steel factory. A $1.6 billion deal was signed in Beijing last year that includes the construction of a carbon steel factory and a power plant. Additionally, Indonesia’s Investment Coordinating Board has designated three provinces — North Sulawesi, North Kalimantan and North Sumatra — for BRI investment. Future plans include the development of new industrial parks, ports, airports and tourism. Despite the delayed railway construction, Indonesia continues to have high hopes that BRI will help cover the funding gap in President Joko Widodo’s $355 billion infrastructure drive. Bangladesh’s experience has been similar. Its BRI projects were given a huge boost by Chinese President Xi’s momentous 2016 state visit — the first by a Chinese head of state in 30 years. But after an initial spike in activity, construction has slowed. “It started off pretty well, but while it’s a bilateral initiative, it’s not really just bilateral. There are other geopolitical issues which can play a part in actual execution. We see a bit of a slowdown,” said Naser Ezaz Bijoy, CEO at Standard Chartered Bangladesh. The CSIS Reconnecting Asia Project has identified three key BRI projects in Bangladesh: the Dhaka-Jessore rail line, the Payra power plant and the Karnaphuli Tunnel — the country’s first-ever underwater tunnel. Chinese development banks dominate the projects’ financing, while Chinese contractors often take over the construction process. The construction stage for the Karnaphuli Tunnel is less clear. State-owned China Communication Construction Co., signed a $705 million contract with the Bangladesh Bridge Authority back in 2015. But in November 2017, Bangladeshi newspaper Financial Express reported that construction work had not started because the BBA was waiting for the Exim Bank of China to release funds for the project. Whatever the delay, Bijoy notes that the two countries are a good fit. “China has overcapacity onshore and it’s not growing as fast as it did in the past, so it would require external demand to support its production. Countries like Bangladesh growing at 7% will have that demand,” he said. Talks on a possible rail project began in 2001, long before Xi introduced the idea of building a “New Silk Road.” The two countries did not sign a Memorandum of Understanding until April 2010, however. After a number of further delays, a ceremony marking the official start of construction was held in December 2016 at Luang Prabang, Laos’ ancient royal capital, which will be one of the main stations on the new rail line. “When it comes to Laos, China has for many years had a strategy to use its railway system to drive into Southeast Asia to bind these countries to China,” said James Stent, who served for 13 years on the boards of China Minsheng Bank and China Everbright Bank in Beijing. There are complaints among Laotians that the labor on the rail line is predominantly Chinese, detracting from any knock-on benefits to the economy. Development banks worry that the $6 billion rail project will exacerbate Laos’ already precarious debt levels, which reached 68% of GDP in 2016, increasing the debt distress level from “moderate” to “high” in the recent World Bank/IMF Debt Sustainability Analysis. Laos’ budget deficit in 2017 was 4.8% of GDP, compared with 4.6% in 2016. A worry hanging over the joint venture is: Who will pick up the tab if the railway does not make money? That may be more of a concern for Laos than for China.